SECTION – segment, part, component, or in terms of photography a crop of a larger view. Have you ever taken a photo of something and then cropped it to add interest, to improve composition or to zoom in on something? I do it often. 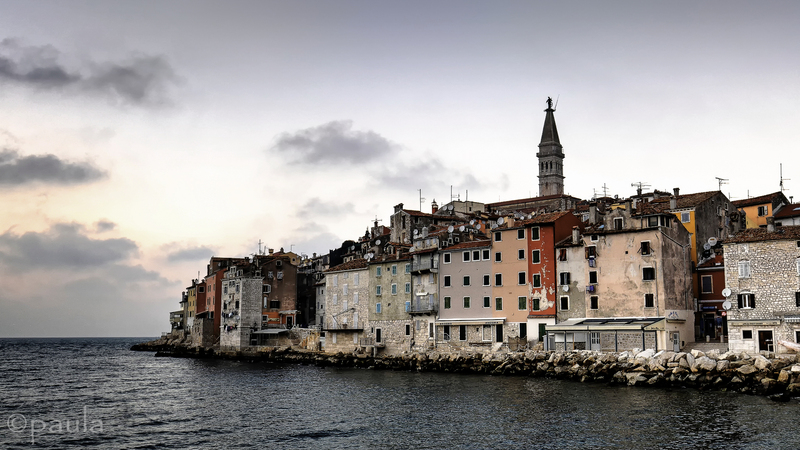 For this challenge I am showing a cropped view of Rovinj, coastal town in Istria. With the approaching Labour Day I am taking a couple of days off and will be linking to your posts on Tuesday. This also means that we are going to skip Black and White Sunday this week. See you all very soon. I crop all the time, partly because I can never see what I’m photographing in my very scatched screen. But never with results like this. You’ve got the silky shimmer of the sea, the brickwork, the blue-green window frames, the perfectly placed spire, those wonderful oblongs of orange and red, and then the absolute forest of connectivity devices. So much glorious detail. Enjoy your unconnected days! Oh a nice crop – great detail visible, especially all those satellite dishes. Have a great restful weekend Paula! I crop a fair bit, mainly when there’s something I want to highlight for a blog post. Sometimes to improve composition or remove something irritating like litter. Here is my London crop to highlight the bus and give a hint of what’s beneath the bridge. Enjoy your time off. Interesting that Labour Day here is in September and not May. GREAT topic and ironically, that’s exactly what I was doing today. You would never know you’d cropped that photo. It’s looks perfect! Lovely crop and a beatiful music. Parabéns Paula!!! Very detailed and precise, it doesn’t look like a cropped photo…! Have a good time , happy holidays ! I have started cropping more. Your example is perfect Paula. Enjoy your time away! I also love to do some cropping!! Your photo is just stunning! Have a nice break! About a third of the way across from the left there’s a browny red building. I’ve seen a close up of that little ‘street’ on the water’s edge. A good friend was there some years ago. I’ve always wanted to visit. 🙂 🙂 Lovely, atmospheric shot, Paula. Enjoy your hard earned days off. I shall be in Bristol, celebrating an 80th with a different and very lovable friend. 🙂 Thank you, Sue. I will have to get ready for our trip tomorrow. I will link to entries on Tuesday. Just this once I will skip B&W Sunday. See you! This should make you smile! What made me smile about your shot is the incongruity of all the old buildings, some in urgent need of repair by the look of it, and the modern (ish) satellite dishes dotted all over them! You can see similar scenarios over here. Drive through any run-down area and you are bound to see a satellite dish on the roof and maybe a brand new Beemer or SUV parked outside. People’s priorities often baffle me. Paula I just love this photo- the perspective and the colors against the water are beautiful. I often crop for interest. Enjoy your days away! Yes, Rovinj 🙂 Have you been there? Yes, I visited the town some years ago. Really enjoyed the old town and I would love to go back some day. Merci, obrigado, gracias, et tout çà. Et bon week-end du 1er Mai. Great history in horizontal layers, the ancient stones (thought they may be newly place there) of the breakwater, the recently renovated lower storey, the older more dilapidated upper storeys, they the crowded satellite dishes and aerials of the 21st century, finally the solitary medieval tower. Thank you, Linda 🙂 I’m back now. Cropped to a great composition, Paula. Paula…your image awakens a desire to travel…to connect with a world beyond. Hope your days off nourish your soul. HOPE YOU HAVE A GOOD TIME , PAULA! Beautiful photo. I love this. Is there a black & white sunday post today? Not this Sunday, I’m away for Labour Day. Next challenge is on Thursday and next Sunday. Gorgeous detail and clarity in this shot, Paula. Wow! Paula, you are a magician. Have a restful long weekend. Magnificent Paula! What a stunning coastline. Thank you, Lisa. Croatian coast is really wonderful.